No matter what sort of event you are holding, if you want immersive engagement - and we mean the proactive, excited kind of engagement - then you’ll have to create an event experience that captivates your crowd. This was the case when Norton 360 by Symantec came to us (a few years ago now) with just such a request - they were soft-launching their latest version of the famous antivirus program, and wanted the invited guests (media journalists and technology bloggers) to really get engaged with their presentation. We came up with an event concept that achieved this result for them – and here is why, how and what we did. In our opinion, the most important thing to note about brand activations and product launches is to know who is attending or who your target audience is. Is it a public event, small specialized guest lists, stockholders, potential clients, or are they members of the local community? This is important, because we need to know what their pre-existing interests are in regards to the brand or product in order to create an experience that will achieve the desired outcomes. In the case of Norton 360, their target audience were members of the media and tech-centric journalists who were, of course, already familiar with their brand’s previous iterations of the product. As a result, they needed to create an event experience that not only catered to an informed audience, but had a creatively engaging edge that would appeal to their imaginations and therefore spur them to report, blog and publish on the product. To achieve these targets, we came up with the notion of “a secret government agency looking to recruit the best candidate into their secret faction”. After all, anti-virus software is supposed to root out malicious software and viruses that will harm your computer, a bit like super crime fighting agent spies, but the criminals are hackers, computer viruses and malware. To stand out amongst the other brands at the conference, and to ensure as many target audience members attended the presentation as possible, we thought it was wise to create an experience that went beyond the product launch conference itself. With Norton 360, we created an event within an event, by focusing the participants’ attention firstly on something purely for fun, but also calls for their specialized knowledge about the brand’s products. This gives our target audience an idea of what to expect later on at the event itself - an interesting, fun but valuable product launch presentation. To maximise the exposure, contact, and uptake with our targeted audiences, we think it is vital to not only engage them during an event, but that the event itself would be enhanced by unique and creative points of contact prior and post event date. As attendees needed to register for the event, we wanted to use this opportunity to create a bit of mystery and entice them to attend. So, how do secret agents receive their communications and mission briefs? 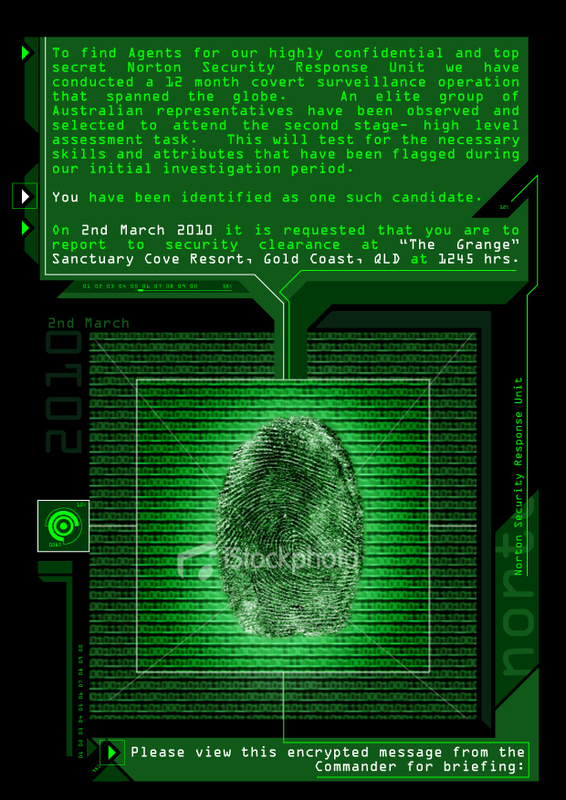 The first invite that the guests received was an e-invite, designed to appear like a science fiction spy mission brief. This was a very basic invite, but the language of the content and the visual style was starkly different to what you would typically expect, that it immediately gave them the notion that this was going to be a more bespoke experience. Attached to the email was a small video of an actor (similar to the Agent Smith character from The Matrix) speaking directly to the recipient, giving a “mission brief”. The production level/creative effort showed the individual that Norton 360 had committed to make their event exciting, different, and perhaps more important, it makes the guests feel specially selected and valued. At the same time, the video starts the narrative that will be further played out during the main event itself. We then followed up with another completely unexpected surprise! Each guest was delivered a Norton 360 branded USB stick to their hotel room, where they are given their next set of “top secret instructions” along with a code word to gain entrance to the event. We thought this was especially ingenious, as we knew that each guests would have their laptop with them, and by using it to interact with the brand, in the privacy of their rooms on site, would only enhance their experience and drive the storyline further. By creating a little video instruction and the ‘room drop’, not only were we able to creatively communicate further information to the participants, but we were also able to cement the experience relevant to the secret agent theme and once again their engagement in the brand. When the actual day arrived, we ensured that the build-up was carried through the moment they arrived. The structure of the day was specifically designed so that the speeches and the activities were all incorporated into the theme. Each attendee was greeted by the same Agent Smith character that was featured in the top secret video; and asked to give the secret code that was included in the Room Drop video. Attendees were also given name badges and “sensor nodes” on their temples and wrists to monitor their vitals and brain wave activity. These were the little touches that signalled to the attendees that their expectations, as set during the pre-event stage, will be met at the actual event. The event MC, a performer in the role of the “Commander”, introduced the company spokesperson, who continued the story plot by explaining to the attendees that they were to do a series of tasks and quizzes with questions relating to Norton, the anti-virus industry, and cybercrime in general. A sample of a name badge that attendees used. The extra level of effort that went into a name badge showed commitment to the narrative and experience of the event. Good audience engagement at events comes as a result of commitment, involvement, and satisfaction. We aimed to address all three of these during the Norton 360 event. We showed commitment to both the event theme, and to the purpose of the event in creative and unexpected ways; we involved the attendees deeply at every stage of the event, creating a pseudo-mission that raised the stakes, and appealed to their ego and imaginations; and we created satisfaction when the teams were able to correctly answer the quizzes, or win the mini games at the actual event. Post event follow ups are so important - they create closure and conclusion to an experience and another contact point to pass on media, information, gain feedback and again embed your branding. In the case of Norton 360, we created a simple post-event follow up video where each attendee is given a mission debrief. The debrief outlined that the attendee performed their tasks so well that the secret agency felt it important to keep them amongst civilians, so to maintain social order. 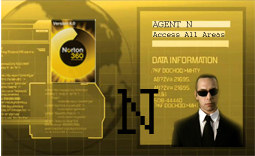 The Agent left the attendee a final mission: Spread the word that Norton 360’s new product is the fastest and most reliable of its peers. Here, we were able to creatively assert the purpose of the event, one final time. While the event itself was to launch the new Norton 360 antivirus program, the goal of the event is to have the media and the journalists positively talking about the product in their publications. By sending out a creative follow-up, it reminds them of the experience that they were a part of during the event itself, helping them relive the fun of the pre-event, the actual event, and thus placing them back into a positive mind-set associated with the brand and product. Norton 360’s product launch was just one of many examples of what we can do for brand activation and product launches. Our speciality is coming up with creative solutions and ideas for all kinds of events, and that includes commercially driven events such as these. What makes Applause services unique is our experience and background in theatre, events and marketing. This unique combination of creative lateral thinking in the planning stages and expert performance and improvisation results in events like no other. Customisable and competitive entertainment packages such as our Game Show LIVE! or Minute to Win It are great examples of how we are able to work in this theme to entertain and work in the brands messages. If what you read today has been useful, it’s time to talk to us about how we can help you. Creating a new concept for your brand activation or product launch and promotion is what we love to do. Together we can create successful and immersive audience engagement before, during, and after your event. Call us today on 1300 261 545 or fill in our online form.